Here’s a leadership lesson I learned from Hollywood – yes, Hollywood! And it’s a good lesson for those of us who lead groups. The lesson comes from a movie set during WWII. 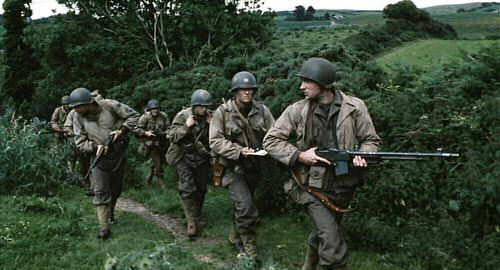 The 1998 movie, Saving Private Ryan, was about a small group of soldiers under the command of Tom Hanks. As their captain, Tom Hanks (Captain John Miller in the movie) had been ordered to take his small squad of soldiers on a manhunt into the French countryside. Their mission? Find a missing paratrooper named James Ryan and bring him back alive – his three brothers had been killed in battle, and the U.S. military was sending him home to his mother since three of her sons had already been killed. The soldiers in Tom Hanks’ squad began debating the merits of searching the German-infested French countryside as they started their journey. The soldiers griped to one another, reasoning that they’d probably all be shot and killed themselves, and that one man’s life wasn’t worth the cost of all of theirs. Besides, they weren’t even sure that James Ryan was alive. It seemed like a futile mission. That’s when a great leadership lesson took place. One of the soldiers asked the captain, Tom Hanks, why he wasn’t griping, too. The soldier noted that his captain had been unusually quiet and refused to join in the fray. “Gripes go up,” Tom Hanks told his soldiers. He made sure that his soldiers learned this valuable leadership lesson that day: good leaders never gripe down to others. If they have a complaint, they should take it to their superior officer, not downward to the enlisted men. Griping down to others would do nothing but cause damage to attitudes, and could hurt the ability to lead effectively. There’s a lesson to be learned from Tom Hanks’ example in the movie. What can we learn from this as leaders of Bible study groups? If we have a gripe or complaint about something related to the church, a staff member, or another member of the Bible study group, never “gripe down” to the members of the group. If something is really wrong, don’t be a part of spreading rumors, causing dissention, discouraging people, or causing trouble in general. Instead, “gripe up” and set an appointment with the person to whom you are responsible for your ministry (probably the person who enlisted you). If you have something against another person, approach him and talk it over and seek understanding and reconciliation. But never gripe down, always gripe up. Griping down to your group members could turn an entire group sour, and that’s nothing a good leader should be a part of. Be part of the solution, not part of the problem. Gripe up. What about griping sideways? Seriously, good article. Great insight. When you “gripe up” there may be few people, but they can do more, but when you “gripe Down” there are more people, but they can do less or nothing to help the situation.